Roll on Buddy, Roll On! Rolling does more than just increase green speed. A few years ago, I was reviewing the task-scheduling program of a golf course in western Canada and came across a spring task called flintstone greens. Curiosity got the better of me and I contacted course staff to find out just what flintstoning was. It turns out that they had inherited a heavy asphalt roller from a contractor who had done work on their cart paths and found that it was ideal for smoothing out their greens after a hard Alberta winter. (Note: For those of you who didn’t wile away their youth watching Flintstones cartoons, or have wisely avoided seeing the John Goodman movie, here is a video illustrating the source of this reference https://youtu.be/2s13X66BFd8). 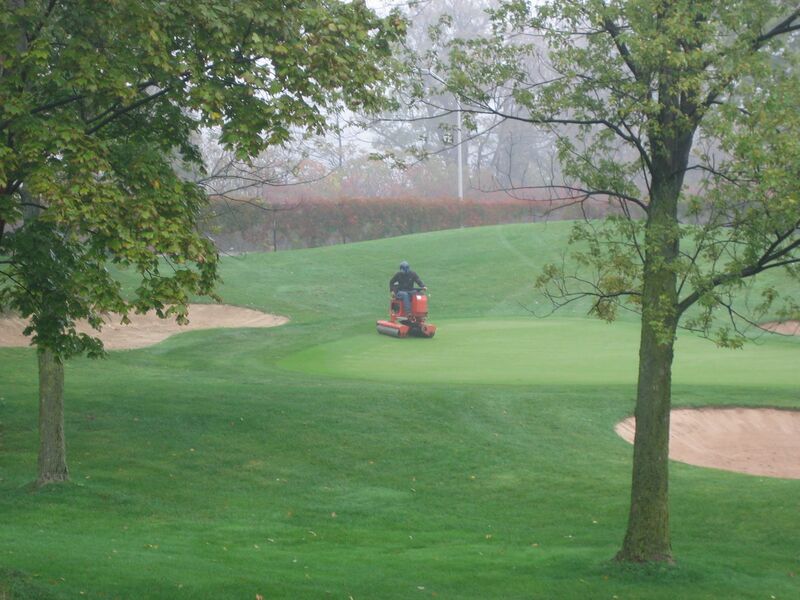 The practice of rolling has come and gone and come again in turf management. For many years aggressive rolling of turf areas was generally discouraged other than after seeding to firm up the seedbed or after sodding to improve sod to soil contact. In recent years, rolling has become a much more common practice on turf surfaces and specialized machines and machinery attachments have been designed for green, fairway and sports field rolling. Lawn rolling remains a lucrative spring service in the lawn care industry. Sod growers often roll in advance of harvest to increase the yield and quality of harvested sod. Let’s take a look at some points related to the role of rolling in turf management beyond seeding and sodding. Smooth out heaving from the freeze/thaw cycle. This is the main reason we see rollers moving around residential neighbourhoods in the spring but it also applies to greens, tees, fairways and sports fields. On low-mown turf soring rolling can reduce mower scalping and improve ball roll early in the season. Reduce localized dry spot and improve soil moisture retention. Rolling reduces the incidence of localized dry spot, increases soil moisture retention and turf root mass. Disease Reduction. Dollar spot begins to appear around the same time as lilacs are in early to full bloom and iris are in early bloom. Both research and practical experience have shown that regular rolling results in a reduction in dollar spot severity and an extended period of protection from fungicide applications. Rolling is generally considered a superior method of dew removal and may contribute to reducing other diseases through reduced leaf wetness. Lower the apparent height of cut without lowering the actual height of cut. On greens and fairways, turf managers claim that rolling allows them to provide faster greens and tighter lies at a higher height of cut than would be possible without rolling. Green speed measurements support this claim. Higher mowing height generally equates with healthier turf. Golf course superintendents may roll as a periodic substitute for a mow or add rolling to increase green speed especially for special events. There is also the practice of target rolling in the vicinity of the hole that increases golfer perception of green speed without rolling the entire putting surface. Thatch reduction. When combined with sand topdressing, regular rolling is thought to reduce thatch accumulation by the grinding action of the sand particles on the thatch. The improved surface moisture retention may also facilitate the activity of thatch degrading microorganisms. Smoothing greens and helping core holes close after aerification. Many superintendents routinely roll their greens after aerification to smooth the surface and speed up aeration hole closure. To the casual observer, rolling after aerating would seem counterintuitive as one of the reasons for aerating is to alleviate compaction and regular rolling would likely increase compaction. Recent research by Dr. Thomas Nikolai at Michigan State University indicates that rolling five times per week both improved green speed (2 feet faster after two weeks) and helped the aeration holes close faster. Soil cores taken at the end of the study showed no difference in soil compaction on the rolled versus unrolled plots. Sustainability. As indicated above, a well-planned rolling program can be part of a money saving, pesticide reducing, sustainable turf management program by allowing higher and less frequent mowing, improving the conditions for growth and reducing disease pressure. Rolling is not without risks. Avoid rolling during wet conditions especially on fine textured soils. Water acts as a lubricant for soil particles and rolling when the soil is wet can result in serious compaction issues. Routine rolling can also cause wear damage to turf particularly on the edge of greens with tight turning areas. Rolling should be avoided during times when the turf is under stress. Do you flintstone your turf? What role does rolling play in your management program? Leave a reply/comment and let us know. Binder, Nick. 2014. Rolling with the cool kids. Sports Turf Manager. Summer. 27(2): 1, 4-5. 30-37. Nikolai, Thomas A. 2015. Weighing in on rolling after aerification. Golf Course Management. March. 83(3): p. 82. Shaffer, Matthew G. 2014. Fairway management at Merion Golf Club. 2014 GCSAA Education Conference: Conference Session Presentations. p. [1-74]. Pub 384 Protection Guide for Turfgrass – 2017 version now available! Did you hear? We’ve made great improvements to the Agricultural Information Atlas!